Near the end of the Saturn's life an arcade game called Fighting Vipers was converted to Sega's console. 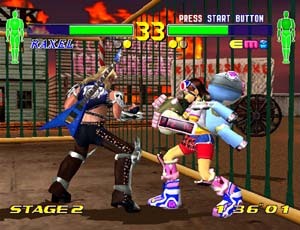 This game was basically a relaxed version of Virtua Fighter, except with Fighting Vipers the characters had the forethought to dress up in armour which would break under some serious beatings. All the fighting arena's were enclosed in cages which made the action that much more intense as the walls were used as weapons. 3 years ago the sequel imaginatively titled Fighting Vipers 2 was launched in Japan. The game bombed, no one like it, and to this day it never went on general release. So the only place you could play it was Japan and those official Sega arcades. The reason why people disliked it was obvious. Virtua Fighter 3 had come out and much was expected from FV2, but instead the game was just a new version of the original Fighting Vipers game, albeit with some new characters. Now the game is out on Dreamcast, quite why Sega chose to wait so long before releasing the game is a mystery. The DC version looks like the arcade version. AM2 have done a good job of converting the Model 3 -step 2 board to the DC, all the arcade, survival and random battle features are in the DC version and that is it. Those expecting some exclusive home features will be disappointed. FV2 introduces us to 4 new Vipers. Emi, is a 12 year old girl who fights with a teddy mech. Charlie is a BMX biker who is a rival of Picky's, the other two are hidden characters. One is Del sol, and the other is Kuhn - a dural type character. The returning Vipers have all been upgraded and have better armour. Honey once again has the leather leg padding and wings, and as in the first game you can play her in her underwear it will just take you a long while. Just like real life! 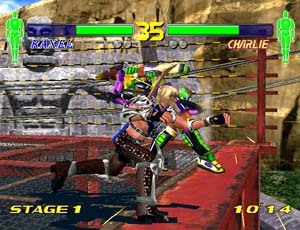 Although FV2 is described as a 3D fighting game it plays firmly in two dimensions. There is no option to side step your opponent. 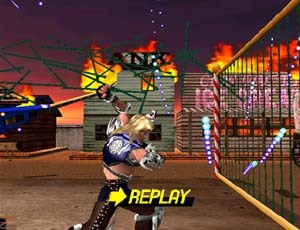 Some attacks will send you into the Z-axis but only temporarily, as with the previous game FV2 uses the PPK system which means even a novice can pull of successful moves, however unlike Soul Calibur it is impossible for an experienced player to be beaten by so called 'button bashers'. To even up the odds the 'super KO' has been upgraded and now counts for 2 wins, this seriously affects the tactics. To use the super 'KO' you have to throw off your armour, which makes you faster, but you take a lot of damage, very risky. FV2 has a crazy story revolving around kidnapping and personal battles which all leads to B.M, however all this story is redundant in the game as it doesn't matter what character you finish the game with, there is no ending. Thus the plot really has no purpose. To try and inject some lastability certain characters have different outfits to collect kinda like Dead or Alive 2, you get these by performing well in the available modes. FV2 does not try to hide its arcade heritage which will put a lot of people off, which is a shame as not every game needs an art gallery which you will look at twice, then forget about it. However it would have been good if Sega had included the original Fighting Vipers to complete the collection. The music is average, some of the tracks are good but the majority you will not even acknowledge. Sound effects on the other hand are quite the opposite. The sounds that accompany the throws are truly great; as is the bowling pin throw sound and Raxel's guitar cord which sounds every time he hits someone with it. Recommending this game is very hard. 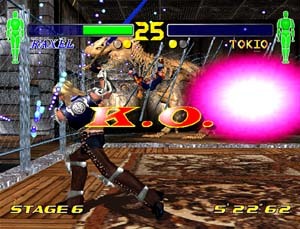 Everyone has Dead or Alive 2, or Soul Calibur, so why would you want another fighting game which is not even true 3D. Well it goes down to personal opinion as always. Those who enjoyed the original version will love the sequel as it is more of the same with some new characters, but to the rest of you it is probably a game that you try before you buy. Fighting Vipers 2 is no way a bad game, it is probably just too little too late. 7 Typical brightly coloured Sega characters. Arena's can seem a little sparse. Sound 7 An equally poor male one replaces the awful female voice over from FV1. The music is good, although nothing special. Gameplay 8 Quality fun. Significantly different from the other 3D fighters, but plays in two dimensions like the SF-EX series. A truly fun game which you will keep coming back to. A real fan game as the manual only lists a few moves, the rest you have to figure out for yourself. "Fighting Vipers 2 is another decent beat em up addition to your DC games library."